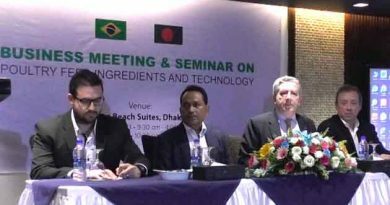 Ambassador to Bangladesh Earl R. Miller visited RajshahiMarch 27-29 to promoteU.S. educational and cultural exchanges, economic engagement, and law enforcement cooperationin the region. 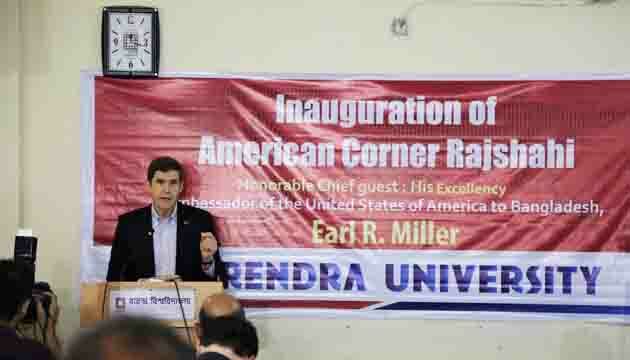 Ambassador Miller inauguratedthe new American Corner at Varendra University, reviewed U.S.-supported cultural preservation work at the Varendra Research Museum, presentedcertificates to students in the English Access Microscholarship Program, andjoined students in the screening of U.S.-funded films designed to encourage tolerance, non-violence, and community engagement. Ambassador Miller thanked Varendra Universityfor hostingAmerican CornerRajshahi – one of four American Corners across Bangladesh that function as extensions of the American Center in Dhaka.American Corner Rajshahi receives more than 1,000 visitors a month who come to learn about U.S. culture, prepare to study in the United States, and participate in programs.At the Corner, Ambassador Miller met U.S. Department of State exchange program alumni who participated in programs on journalism, English teaching, civil society, biological research, and other topics during their U.S. visits.At Radio Padma, he discussed the U.S.-funded “American English Radio Program” which reaches 1.3 million listeners per episode; met youth leaders working on a U.S.-funded program to reduce violence among their peers; and met two U.S. exchange alumni who operate the station. 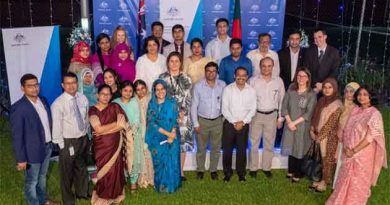 He also awardedcertificates to students participating in the Department of State-funded English Access Microscholarship Program, which provides two years of English study and leadership skills to Bangladeshi studentsaged 13-17. 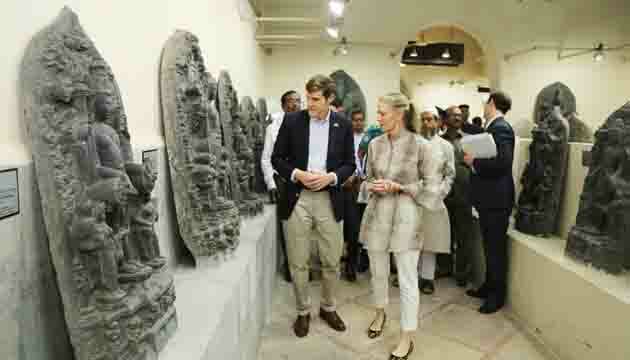 Ambassador Miller visited theVarendra Research Museum to see work funded by three grants totaling $193,000 forarchitectural and exhibition restoration and preservation through theU.S. 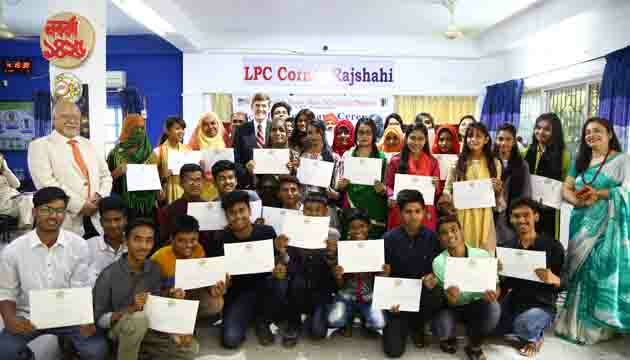 Ambassadors Fund for Cultural Preservation.While atRajshahi University, he introduced “Projonmo Wave,”a short film series designed to encourage tolerance, non-violence, and community engagement among young people. 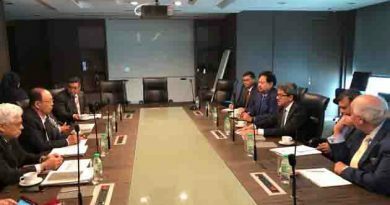 Separately, he met with some of the more than 4,500 current and formeruniversity students and police who have gained a common sense of community through a U.S.-sponsored program operating since 2016. Ambassador Miller visited the Bangladesh Police Academy where he reviewed U.S.-funded programming which has helped train 13,770 law enforcement professionals. He also observed the first Bangladeshi trainer-led emergency first aid course using a new U.S. curriculum. Ambassador Miller was welcomed toRajshahi by Mayor KhairuzzamanLiton. Arrivingthe day after Bangladeshi Independence Day, he paid his respects by laying a wreath at the Rajshahi University ShahidMinarMonument. 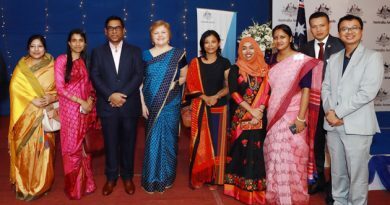 Beyond the meetings, Ambassador Miller visited a local sweets shop for roshkodom, komolavog, and perashondesh; ate kalairutiwith eggplant; and walked along the Padma River at T Badh. He ended his trip by visiting historic sites including the Puthia Palace and Rajshahi College.